They say that the first year is the hardest.....if that's true, then I can hardly imagine how great the next 50+ years are going to be!! We celebrated our first anniversary several weeks ago, on Sept. 16th. 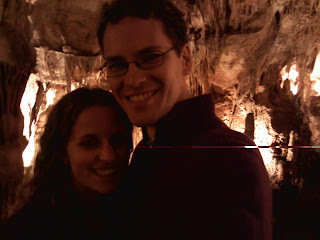 We went down to the Shenandoah area and visited Endless Caverns, and then stayed in a beautiful bed & breakfast out in the country. It was so refreshing to hear cows mooing again! It was a wonderful time to remember that amazing day at the Provo Temple the year before, to plan where our family is going, and to just be in love together. Ahh.... what beautiful countryside! We sure miss it when we spend too long in the city. 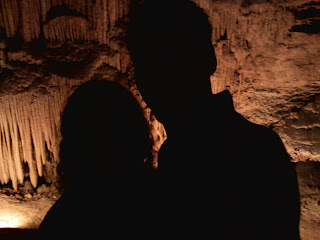 So, for some reason we forgot to take our camera into the caves, leaving us nothing but our cell phone cameras to record the grand adventure. In the end, we got quite a mixed bag of photos...some were good, some were almost good except for the weird digital noise issues, most were blurry, and some were very amusing. I really dig this silhouette one. :D This particular room was actually used as a ballroom during Prohibition. Definitely the most surreal dance hall I've ever seen! Here's one of the pictures that turned out pretty well! 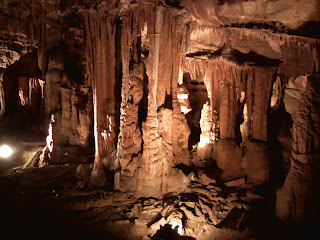 The caves are just full of room after room of amazing rock formations like this. This is the little cottage where we stayed at the bed and breakfast. It was cozy and cheerful--the perfect place to stay for our anniversary! Congrats on making it thru one year. Eternity to go!